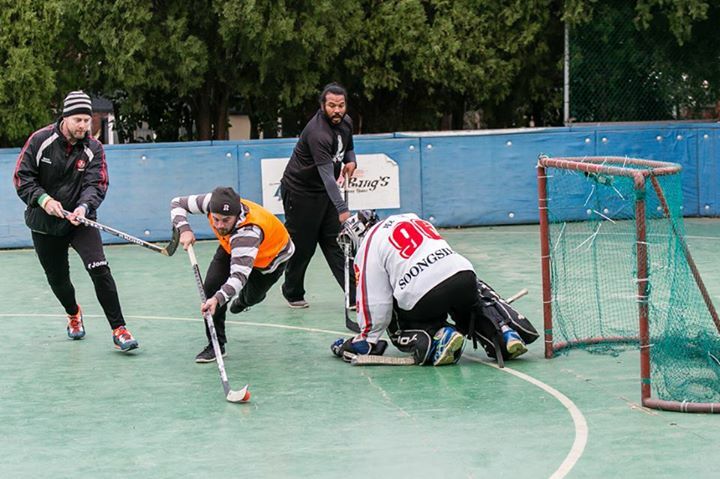 The 2014 Jeju Cup Winter Classic was held Sunday Dec. 7 at Jeju City Inline Rink and organizer Dave Cunning’s own Gwakji Kings walked away with the trophy after dominating the Samyang Sabres 7-0 in the final. The Kings were highly fancied after the dramatic team draw in The Bar, a local watering hole and hockey sponsor in Jeju City Hall on Saturday night. The team included Cunning, a former ice hockey pro, and a strong roster of Craig Grillanda, John Schmale, Patrick Conway, Michael Flowers, Song Jeongmun, Kendra Pugh, Darren Southcott, Ryan Brown, Harold Dale, and Cory Beck. 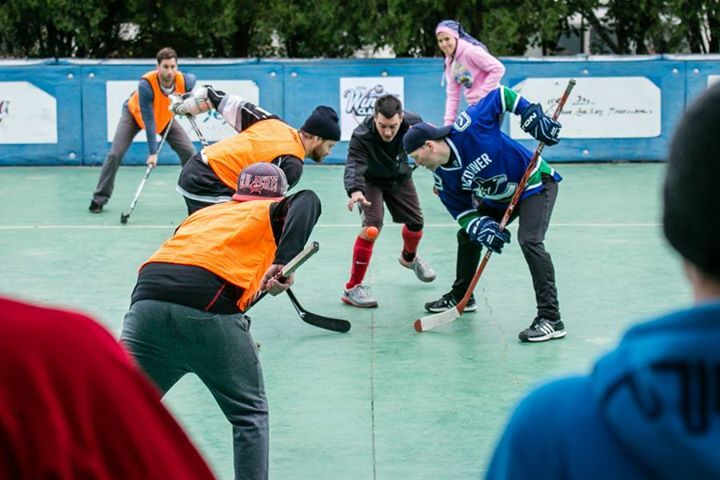 This was the second fundraising tournament for Jeju street hockey after the first in July which rang up 1 million won for the coffers of Jeju Inline Academy. Partly as a result of that tournament’s success and the well-attended weekly pick-up games, the pressure on the club funds had increased. 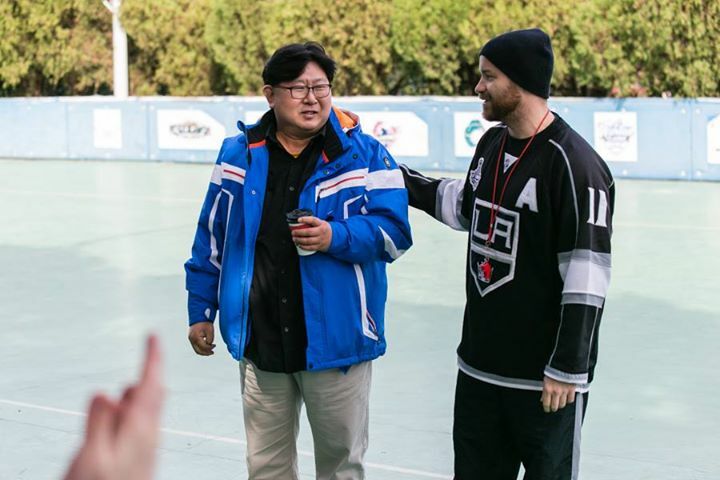 The goal was 1 million won for storage facilities and children’s hockey programs and a total of 66 players and scores of supporters doubled that, ringing up an impressive 2 million won in total. The money was not only raised through the participation fee but also various side games and sales throughout the day. Cunning said organizers had learned from the first event in July which led to a “spark in interest” in the sport, leading to increased attendance at weekly games and more businesses coming on board to sponsor. “We had ambitious expectations, but the results of the Jeju Cup Winter Classic far exceeded our optimistic goals. We nearly doubled our player registrations, we did double our fundraising totals, and judging by the feedback I’ve received, we kept the event as enjoyable – if not more enjoyable – than before,” he said. A special guest was also in attendance, Daniel Park from Warrior Hockey. Park has been pivotal in getting hockey started in Jeju as his company donated much of the equipment for the club. He said he is thrilled to see so much interest in the sport on Jeju particularly as it is so hard to play across Korea. “It was a very nice party, next time I will come with my family,” he said, adding that Jeju Islanders are more than welcome to go and watch a game on the mainland anytime. 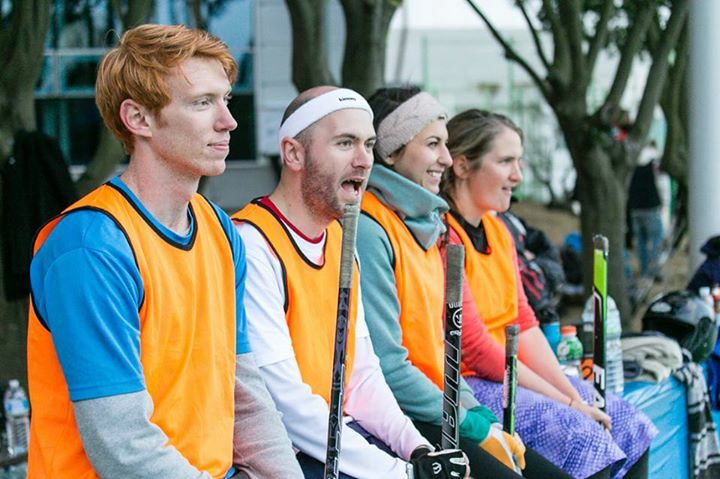 Photographer and hockey enthusiast Eric Hevesy, United States, said he had a “blast” playing in the tournament and was still amazed by the level of interest in Jeju hockey. To get involved in hockey on Jeju Island join the “Jeju Islanders Hockey” group on Facebook or email Dave Cunning at davecunning09@shaw.ca. For more images by Eric Hevesy go to his Facebook page here or his Flickr page here.